"In the portrait by Carjat, his face and his eyes are contorted as if in a terrible rage ; the whole face seems drawn upward and downward in a kind of convulsion ; and the aspect, one confesses, shows a degraded type as if all the vices he had never committed looked out of his eyes in a wild revolt." 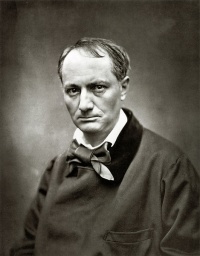 Unless indicated otherwise, the text in this article is either based on Wikipedia article "Charles Baudelaire by Étienne Carjat" or another language Wikipedia page thereof used under the terms of the GNU Free Documentation License; or on original research by Jahsonic and friends. See Art and Popular Culture's copyright notice. This page was last modified 08:06, 16 April 2015.